In late 2015 Human Dynamo Workshop was asked to customise a Honda motorcycle, the NM4 Vultus, into a specialised vehicle for the film Ghost in the Shell. Through a series of communications with Honda, NM4 was customised in our workshops in Miramar, Wellington, New Zealand. 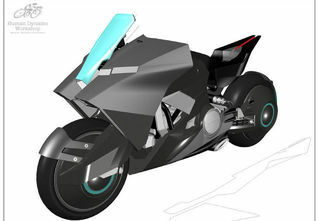 Honda presented Human Dynamo Workshop with a design for the NM4. Our head designer Dominic Taylor translated these designs into a form that would fit and function with the NM4 chassis. Honda worked very closely with Human Dynamo, principal motrocylcle designers from Honda were flown to New Zealand to meet with us to finalise the details for the custom NM4 design. After the designs had been converted into 3D models, Human Dynamo CNC router cut moulds for the fairings and shells of the NM4 on our CNC machines. We then then used these mould to create fibreglass fairings with a carbonfibre application effect. The final vehicle was rideable and fully functional, including electronics. 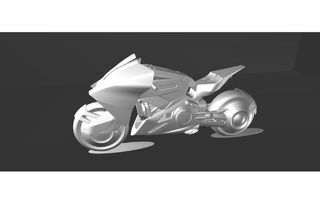 Through the design process 3 versions of the bike were built, the prototype, an adjusted version, and then the final version after the details had been confirmed by Honda. In all Human Dynamo Workshop fabricated 5 of these finalised custom NM4's for use on set for the filming of Ghost in the Shell. The NM4 motorcycle under construction in the Workshop at Human Dynamo. The Honda NM4 during fabrication. Tim Holman finishing the fairings for the custom Honda NM4. The Honda NM4 version 1, fabricated by Human Dynamo Workshop, for Ghost in the Shell. The Honda NM4, version 1, fabricated by Human Dynamo, for Ghost in the Shell. The Honda NM4, version 2, fabricated by Human Dynamo Workshop. 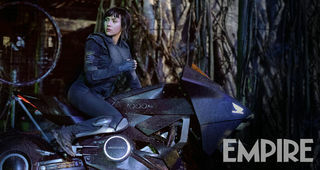 NM4 Honda Motorcycle, version 2, made by Human Dynamo, for Ghost in the Shell. The complete Honda NM4 for Ghost in the Shell, fabricated by Human Dynamo Workshop. Rob Uivel (Director of Human Dynamo) and Tim Holman, putting the final touches on the Honda NM4, fabricated by Human Dynamo, for Ghost in the Shell. In total, Human Dynamo made five of these beautiful bikes. Here are two of the finished Honda NM4 motorcycles, made for Ghost in the Shell. Detail: The final NM4 Honda motorcycle, fabricated by Human Dynamo, for Ghost in the Shell. Detail: The final Honda motorcycle, fabricated by Human Dynamo, for Ghost in the Shell. Detail: The final Honda NM4 motorcycle, made by Human Dynamo, for Ghost in the Shell. Detail: The final Honda NM4 motorcycle, fabricated by Human Dynamo, for Ghost in the Shell.